I had a quick trip to Coimbatore recently with my friend and we decided to explore Taj this time. With the 10k Taj voucher nearing its expiry that i received from My American Express Platinum Travel credit card, this was the only choice i had to put it for a functional use. Last year I used the voucher at Taj Santacruz, Mumbai and I did have a mind blowing experience there. Here too, the stay was pretty good as expected from a Taj property. 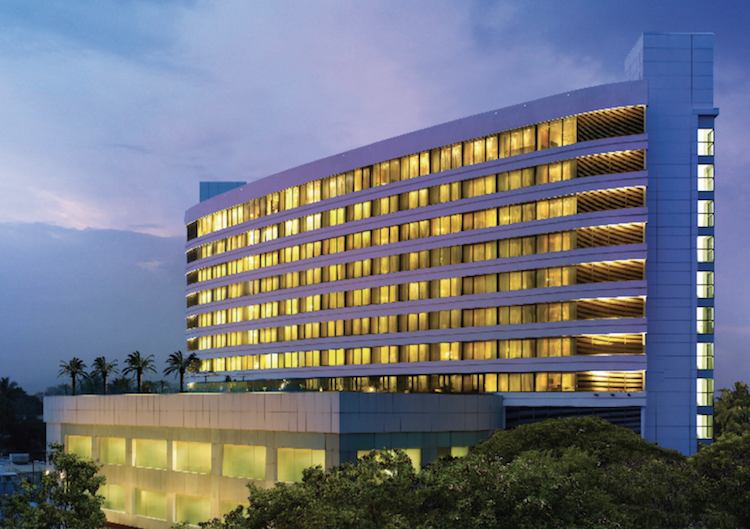 Quick Info: Vivanta by Taj – Surya at Coimbatore is a business hotel that’s very near to Coimbatore Airport & railway station. Its located in close proximity to the Brookfields Mall and the hotel is also surrounded by a lot of high end branded showrooms like Rolex, LP, etc. 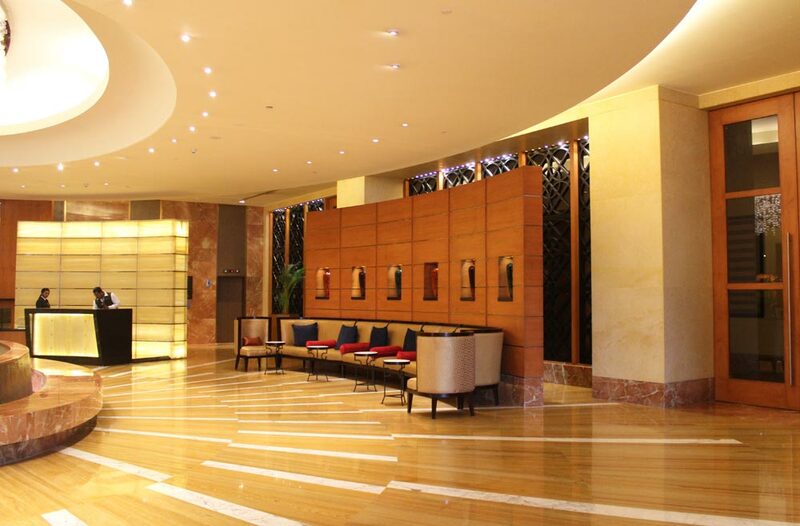 The Lobby was big with seating area on both sides leading to the check-in area. There was no traditional welcome here like I got in Taj Santacruz, though the check in was pretty quick. Looks like they’ve a tie up with Indigo as we saw 2 Indigo Pilots checking in at that time and later spotted two different set of Indigo crew members during our stay. I initially booked the Superior Charm City View room for 2 days, that was then upgraded to “Deluxe Allure Suite” which is the basic level suite, beyond which there is a Presidential Suite, which I had a sneak peak!! 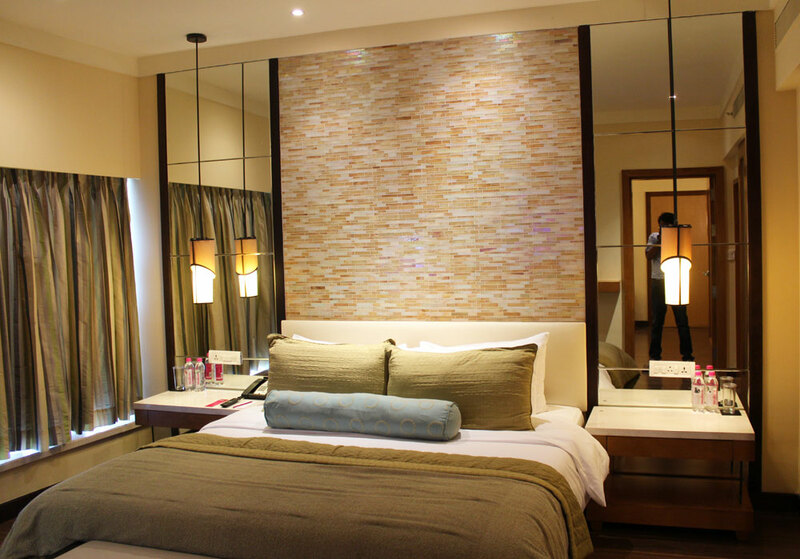 Cost: Presidential suite = 5X of Deluxe Allure Suite !! 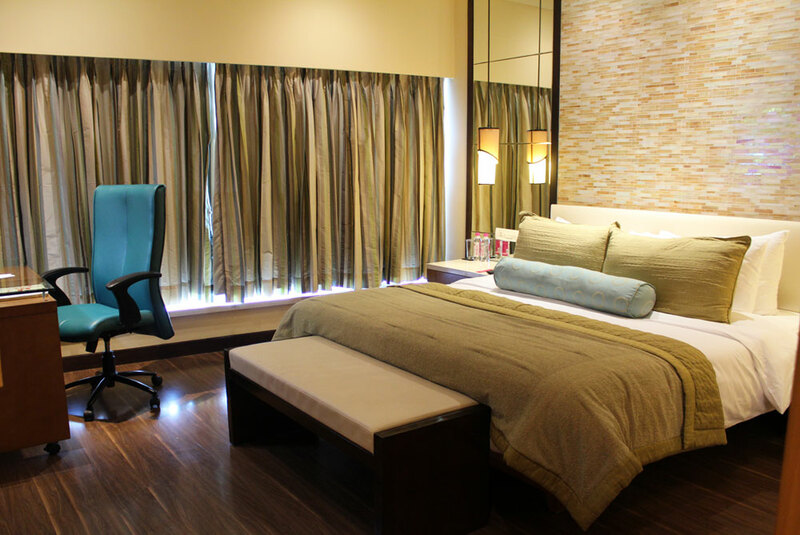 Ok, lets go back to our Deluxe Allure Suite and its review. 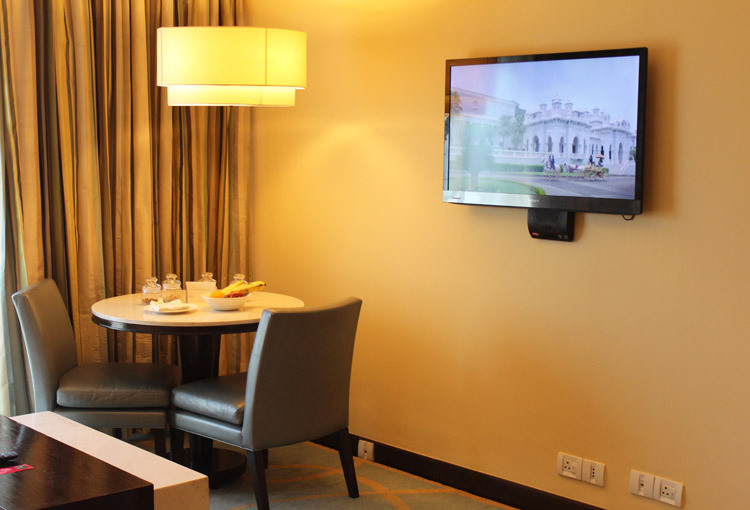 Its important to note that when you’re upgraded, you will be charged GST as per the suite GST rate, which was 24% during our stay. 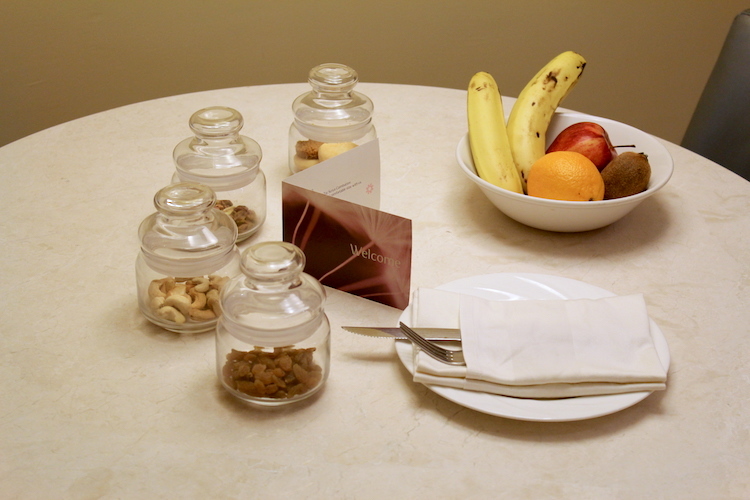 As soon as we entered our suite, located in 6th floor, there comes a living room with sofas, tv and a dining table for two with the welcome amenity – nuts, raisins, biscuits & some fruits. These nuts were really crispy and tasted so fresh. Its in par (infact better) with the ones that I usually get from Amazon. Here are the links to amazon that i usually order – if you may like: Almonds, Cashews, Raisins. Apart from that, there was a personalised welcome note from GM placed on the table, which was nice indeed to look at. I’ve seen such welcome note during my stay at Grand Hyatt, Mumbai as well and its certainly the best way to show a personal touch. Next to living room is the bedroom, the bed was comfortable and fairly firm. Love the work table with the chair that’s functional and serves the purpose. The suite has a good view of swimming pool which is located in 2nd floor of the building. Next comes the closet that was spacious with mirror and weighing machine. Bathroom was equally good with a lot of Taj amenities as usual. I always feel that the soap used in Taj is one of the best that has a good aroma and less oily. With a decent spread, breakfast was delicious as like in any other Taj hotel. The restaurant manager was proactive in collecting feedbacks and explaining about unique servings. 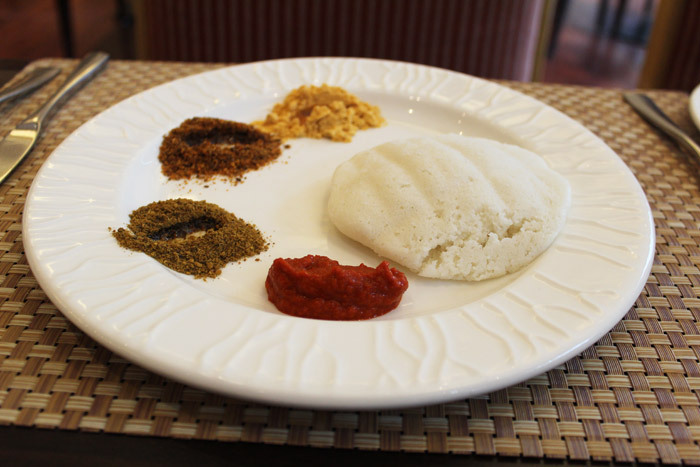 For ex, they had a special Idli called “Ramasseri Idli” a relatively flat, soft Idli with better taste which comes from Ramasseri – a village in Palakkad (Kerala) thats famous for its delicious idlis. The trick, the taste of the idlis is in the way they cook them – You must try this some day! Apart from that, everyone is attentive and get things done for you even before you ask – Oh yea, they always have an eye on you in the restaurant. 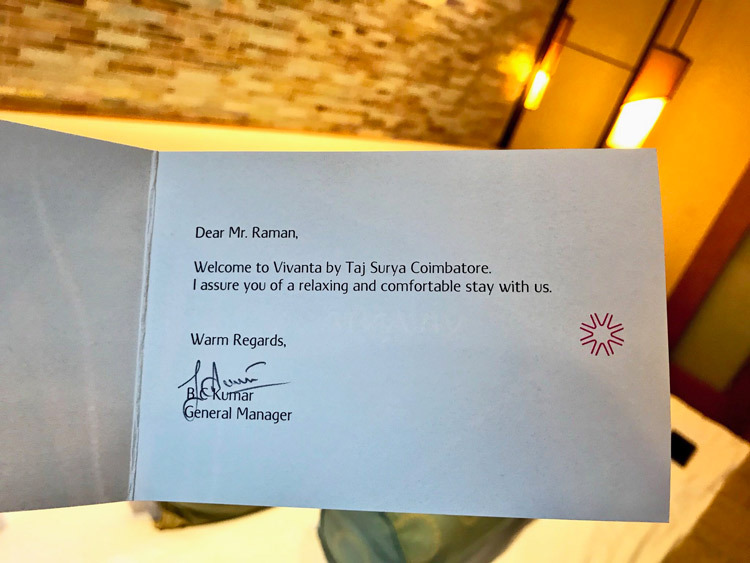 Vivanta by Taj Surya, Coimbatore is the 4th Taj Property that i’ve visited and is certainly one of the best business hotels around in Coimbatore. Considering their rates, which is very much affordable compared to other Taj properties, i would highly recommend checking it out when you’re in the town. I’m sure they’re living up to the expectations as they promise as a part of their new brand Experience – Tajness. Their promo videos are too good that its pulling me every-time i watch them. If you had noticed the above pics, you can see Tajness promo running on Tv’s in the suite all time, by default. While i wish to visit a couple of other Taj properties in near future (Coorg, Bekkal, Taj Mahal Palace), their Loyalty Program is something that needs some face lift. Thanks to Amex Platinum Travel Card for giving the ability to earn Rs.10k Taj Voucher. You can apply for the card here. Which is your favourite Taj Property and where have you used your Taj vouchers received from American Express platinum travel Card so far? Feel free to share your thoughts in comments below. Glad you liked it Anish. Amex Taj voucher usually has 6 months validity time and we can extend it to another 6 months also. 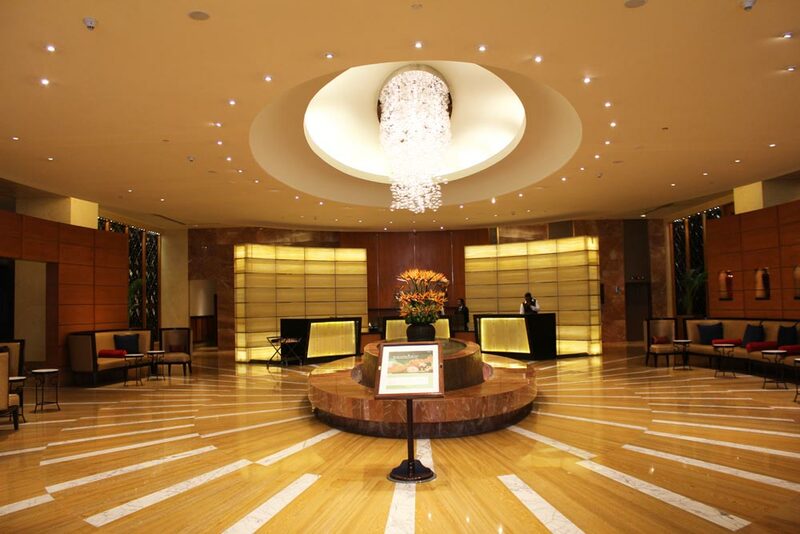 Need to check ,Is it possible to combine two years Amex Taj voucher in a single visit ? That’s awesome. Never knew that i could extend it. It should be possible, as they just add it as a cash equivalent kinda on the bill and charge GST on the voucher amount too! That’s awesome review Sid sir. Card expert gave me so much info. Thanks to abhishek sir as well and infact other readers are so active. 2 months back i had card but didn’t knew there is reward points system for these cards. Thank you so much. Appreciate your work. Thanks for your kind words Himanshu. hope you have returned to good health back from dengue…reading hotel reviews for first time in cardexpert…the review was usefull..looking forward such reviews once in a while..
Ramasseri idly is very famous. When I visited Taj Bekkal, got a chance to taste this and it is really delicious. Anyway welcome back Sid and thanks for the great review (as usual). Sounds good. Hope to visit Taj Bekkal some day. 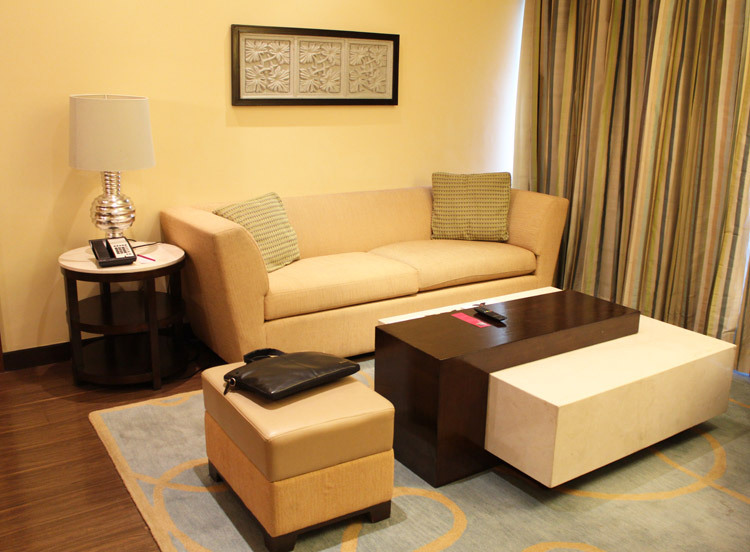 I have used my Amex taj voucher in Taj krishna Hyderabad and it was quite exquisite experience.. Thanks to Amex plat Card.. I got call from Yesbank and opened first account with them with 10 lacs check. He told me about lifetime free credit card himself. Sir my question is will they check my gross total income or gross turnover? If you apply card on card, you dont need to furnish IT docs. What all can be availed with this 10k card? Can it just be used for one night or can it be used for 2 nights too? also can it be used for SPA and dining? Its a stay voucher that covers the Non-GST part of the bill. It cannot be used for SPA/dining AFAIK. Yes, you can use it for 2 nights as i did the same. 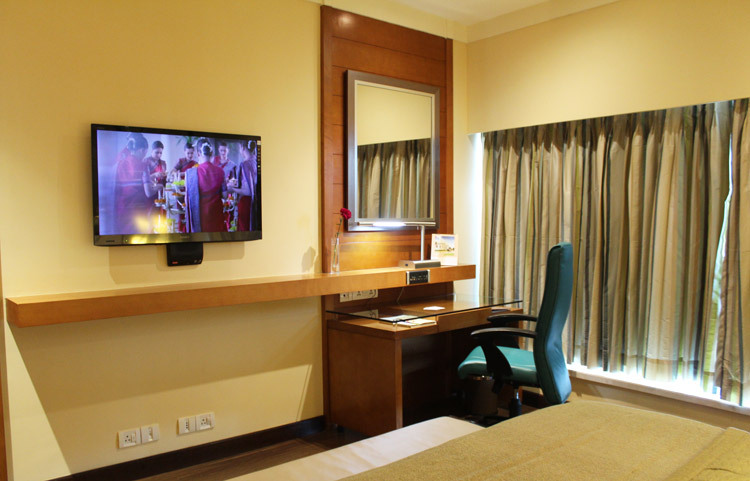 I had gone to Gateway Vadodara on a 2 nights staycation offer with 2 kids and Breakfast and Dinner inclusive. I had a fantastic experience , room got upgraded with better view, Complimentary Pasteries and cookies for my kids with their name on it. Everything was brilliantly handled. We paid by 10K voucher + the remaining amount in cash ( which was sub 3000 INR ) for the entire stay.